Includes: ATW-R1810 Receiver, ATW-T1802 Plug-On Transmitter, ATW-T1801 UniPak Body-Pack Transmitter, Omnidirectional Lavalier Microphone. Audio-Technica’s 1800 Series single-channel camera-mount wireless systems provide extremely flexible, professional, and easy-to-use portable wireless solutions. 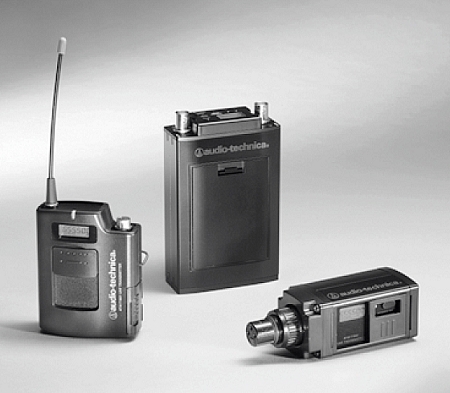 With True Diversity UHF reception (996 frequencies user-selectable in 25 kHz steps), single-channel 1800 wireless systems come equipped with the ATW-R1810 receiver plus a choice of plug-on or body-pack transmitters. The ATW-T1801 UniPak™ bodypack transmitter features a professional locking 4-pin connector compatible with all Audio-Technica Wireless Essentials® microphones. The ATW-T1802 plug-on transmitter features a locking XLR connector for adapting dynamic and condenser microphones. Both transmitters offer selectable high and low transmission modes to conserve battery life/maximize power. Additional 1800 Series features include automatic frequency scanning, Tone Lock™ squelch, back-lit LCD, soft-touch buttons, headphone monitor output with independent level control, and durable metal construction.